This is part of our Performing Improv programme, which focuses on the skills to perform improv on stage. In this course, we take a look at the bigger picture of developing an improvised theatre show. When does the story start? Where should it go next? Most importantly, how do you decide this in the moment? We’ll train your skills in storytelling and stagecraft, until you’re ready to create a fully-narrative improv show! At the end of the course there will be a showcase event to apply the skills you have learnt. This course takes place on Tuesday evenings. 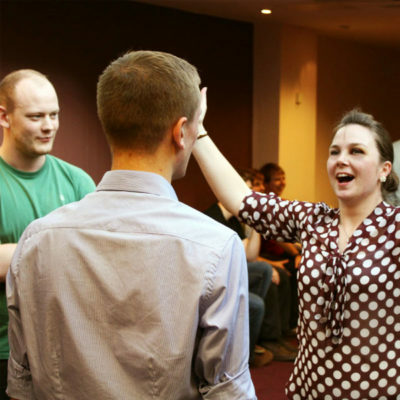 For other course times and locations please see our main Performing Improv page. Imogen Palmer has been training in and performing improv for six years. She is the artistic director of the Delight Collective, the creator of Imogené, The Bish Bosh Bash and Friends Like These. She has trained in musical improv with the Showstoppers (London), Impromptunes (Melbourne), the Maydays (Brighton) and performed in Impro Melbourne’s Smells Like a Song. Will Gawned has been improvising since he moved from Australia to Bristol in 2016 and discovered the BIT, although in retrospect he’s been making it up as he goes along all his life. With a background in scripted theatre, performance poetry, science teaching, creative writing, and D&D, Will is the survivor of two Bristol Improv Marathons, Some Sing About Mary, Pick Your Own Panto and company directing the Unscripted Players.